As our company name NIPPON HAMONO illustrates, our focus is on being the best we can be in the field of cutting tools by cultivating the most refined techniques and creating products that will satisfy our users. 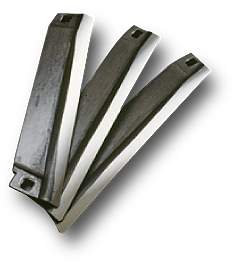 Our company provides the market with blades for industrial equipment, and our unique approach has allowed us to make rapid progress in our field. Our expertise in the manufacture of blades has also garnered us an excellent reputation in precision parts processing. We will continue to modernize our facilities and incorporate new technologies as we push forward with our development of a unique manufacturing system. 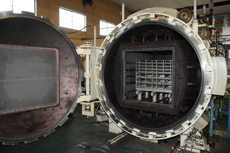 With a maximum temperature of 1350°C (± 2℃), a maximum treatment capacity of 900 kg, and 8 patterns of utilizing a cooling gas flow (discharge/ejection) for the gas quenching of steel (including quenching, tempering, and brazing-quenching), this furnace can also be used for the fine annealing and aging of a variety of metals (ferrous and nonferrous metals as well as formed and fabricated materials). Certificated Health and Productivity Company. COPYRIGHT(C) Nippon hamono ltd. ALL RIGHTS RESERVED.